Students in discussion about the elements that make a good story. Interviewing is a skill and as such it requires both knowledge and practice. The interviewer must be able to formulate good questions that bring out the story. Yet there is another skill that is often overlooked. Today we learned that a challenging and yet integral part of an interview is to truly listen to the story being told. Step 1 – Get a partner, preferably someone who doesn’t know much about you. Step 2 – The storyteller has six minutes to tell their life story while the listener… JUST LISTENS (no talking, no questions, no ‘mmmhhh’, no ‘uh huhh’, or even ‘yes, I see’). Step 3 – The listener is allotted one question to ask the storyteller. Step 4 – The storyteller has two minutes to respond to the question. Step 5 – The listener shares their reflections on the story. Step 6 – Switch roles and repeat steps 2-5. The activity revealed our strong desires to both give and receive feedback. Yet, this forced silence pushed the storyteller to elaborate where they otherwise might not have and required the listener to connect more deeply to the story. The singular question tended to ask for more detail on a specific point of interest or continue further into the story, each leading to a richer understanding of the person and the story they bring. In discussing which elements are important for storytelling, our class looked at examples presented in different mediums and with multiple styles and outcomes. By focusing on stories of undocumented immigrants, we reviewed a short documentary as a group, and then broke up into smaller sessions that looked at how framing styles and different techniques can be used to tell stories. As a class, we discussed a 6-minute documentary titled, Illegal and noted how framing helped inspire empathy and a sense of unfairness. We examined how camera angles, the choice of people interviewed, and B-rolls (background rolls, or background tools) helped establish a frame for the story. We then looked at four examples of storytelling in groups of 2-3 and discussed what worked and was least effective about each piece. – “Just One Thing Missing,” last segment in “Nice work if you can get it.” from This American Life. Audio piece that effectively portrayed the story from the perspective of the interviewee, although ended with a resolution that felt abrupt. – Vargas, Jose Antonio. “Not Legal Not Leaving.” Time Magazine. June 25, 2012. Written piece that used facts to discuss emotional themes, but may have benefited from more multimedia approaches to stimulate human interest. – “Undocumented Dreamers.” Los Angeles Times. June 8, 2012. 7-minute documentary intended for a broader audience but ended without opportunity for follow-up. – Poo, Ai Jen. “Stop with the Us vs. Them Approach.” New York Times. Dec 9, 2012. Perspective from a debate on immigration that expresses the complexities of the discussion, however may have benefited from using other media. Our last activity introduced a new and unexpected storytelling device, using public data to help us arrive at a deeper understanding of our subject matter, and perhaps reveal new, untold narratives in the process. Journalists and academics have long relied on statistics, information graphics, and other kinds of data to formulate arguments or frame issues. In these cases, however, data is usually used retroactively – as a way to support existing hypotheses or illustrate identified trends. In our class, we decided to flip the script and instead use the public record as a vehicle for investigation! – First, we were challenged to think of a piece of date or a statistic that resonated with us. For example, one student mentioned that 28% of Americans have converted to other religions. Are there pieces of data that have inspired new questions for you? Where have you seen numbers that seem to hide stories behind them? 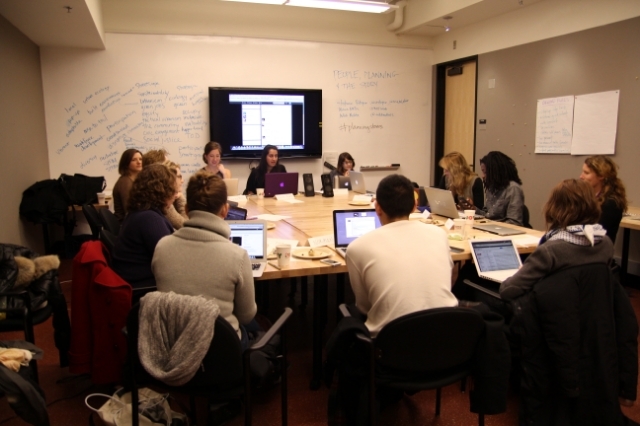 – Next, our instructors introduced us to a nifty website called the MetroBoston DataCommon. This free resource allows users to customize their own research question and visualize the public data preloaded on the site. -If you scroll to the bottom of the page, you can see maps that other users have created and use these as inspiration. -Finally, using this tutorial, we created accounts and began experimenting with our own simple maps as way to discover and research new stories. This approach can be applied to many different mapping programs, or even traditional research methods. The idea is to use the visualization of data to explore the human experience often ensconced in the numbers.